When people think luxury properties for sale on Hawaii Island they usually think of the resorts along the Kohala and Kona coasts. But truth be known, there are several incredible luxury estates for sale in East Hawaii. This is great news for people who appreciate a certain level of amenities and need to be in close proximity to Hilo or simply prefer the lush tropical countryside of East Hawaii. Here’s a look at some of the luxury homes currently available as well as some recent sales of multi-million dollar properties in East Hawaii. Right now, there’s a great opportunity to own a breathtaking luxury home with jaw-dropping views and plenty of land just minutes from Hilo. Kulana Kea is one the most prestigious neighborhood in the Hilo area. This recently built home at 182 Kulana Kea Dr. offers magnificent views of Hilo Bay, the Pacific Ocean, Mauna Kea, Hilo town – you name it. The views here are simply incredible! 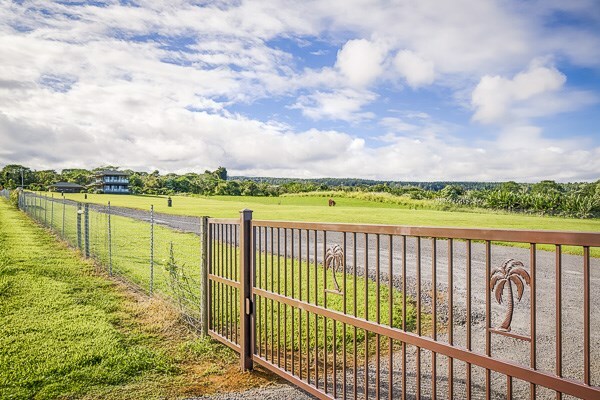 Lots of Hilo homes offer gorgeous views – so what makes this property so special? It features the best of the best and that’s not real estate hyperbole. The kitchen features not one, but two Bosch dishwashers and a six-burner Wolf stove. Each of the three bedrooms contains their own Fujitsu air conditioning unit. 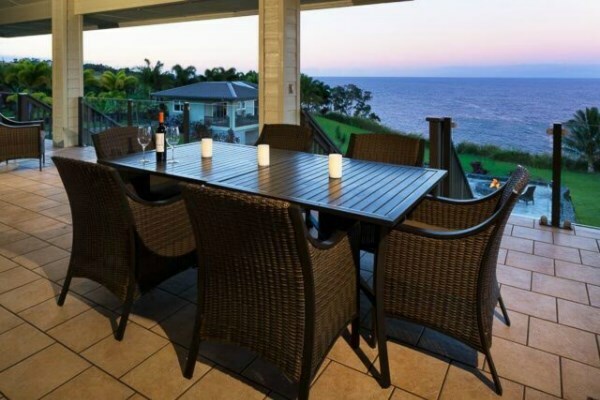 Wrap around lanais on the top and bottom floor offer spectacular views AND an outdoor wet bar and wine cooler. There’s even an outdoor shower on the upstairs lanai with open ocean views. The five-acre property has a gated entry and comes with a covered kennel and mudroom with lots of storage space for equipment, as well as a detached three-car garage with a second laundry room and a bonus bathroom. The level and sheer volume of high-end upgrades in this Kulana Kea home make it a good value at $2.6 million. 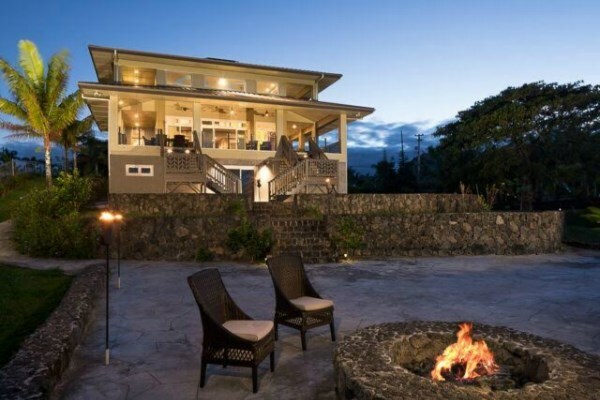 Another outstanding luxury property worth considering is an oceanfront estate in Hakalau that comes complete with its own guesthouse and whale watching observation area. Located at 31-190 Hawaii Belt Rd., this 5 bed, 5.5 bath two-story home has a lot to offer. There are of course the incredible ocean views and the fact that you can fall asleep listening to the ocean waves at night. Once you pass through the gated entrance and travel down the paved driveway, you might never want to leave. And the good thing is you don’t have to – everything you could possible need is right at your fingertips. More than a half dozen variety of fruit trees on the meticulously landscaped grounds mean you can pick your own fresh figs and bananas for breakfast. The kitchen is amazing – it includes two refrigerators and dual dishwashers – plus there’s an outdoor kitchen on the upstairs lanai. And there’s also a fitness room with its own private bathroom (the house is sold fully furnished and the gym equipment comes with the home.) There’s even a jacuzzi tub in the master bathroom to relax in after a workout. This property really has a lot to offer and you can read more about it on Julie Keller’s blog. 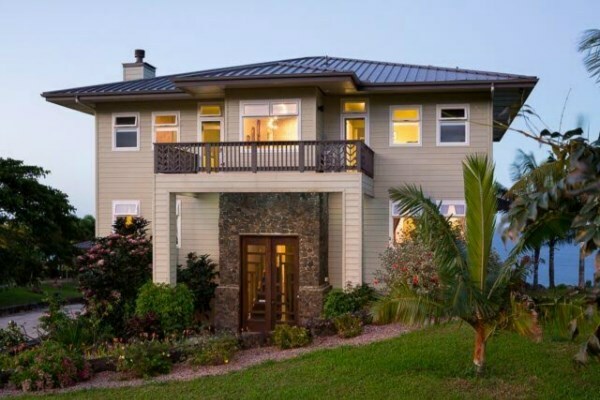 Priced at $1.73 million, this Hakalau property (MLS# 288477) is priced well. In fact, just two months ago a neighboring property sold for $2.6 million. That home, at 31-212 Hawaii Belt Road, was on a slightly larger lot and featured more bedrooms (7 of them) but didn’t have the energy-saving infrastructure of the $1.73 million property. 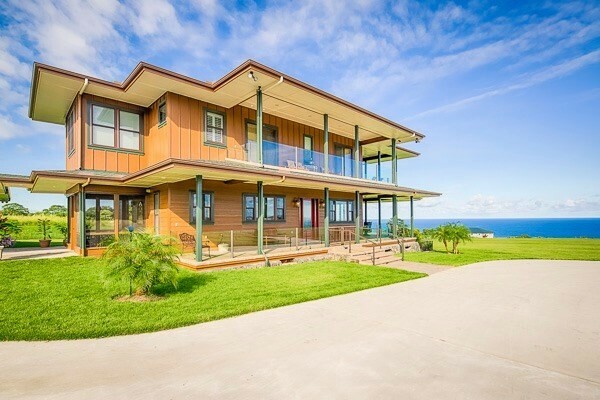 The past 12 months have seen several home sales above the $1 million mark in East Hawaii. Just last month I sold a $1.1 million oceanfront estate in Ninole. Along with incredible ocean views, that home came with three acres of land and its own fruit orchard. Probably the most talked about luxury home that sold (twice!) in East Hawaii during the past year has been the Waterfalling Estate in Ninole. The 10,000+ square foot home that sits on nine acres of land was sold at auction last year for $5.75 million and the new owner put it back on the market almost immediately at an asking price of $8.2 million. It sold last month for $6.8 million – a record for an East Hawaii property.